Hey Kurma, keep up the good work – your blog is an inspiration. Was wondering if you can help. I was shopping yesterday and bought some annatto seeds from a Philippino store. What are they and what do I do with them? Hello Pixie. 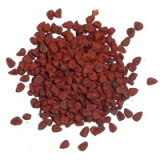 Annatto is used both as a spice and a dyestuff. 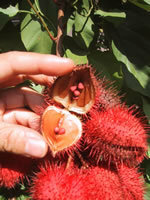 It may be better known to Mexican and Latin markets as achiote or in the Philippines as atsuwete or achuete. Here’s lots more information, plus a recipe.